Baie-Comeau on the St. Lawrence Seaway has started its high season and on Sept. 15 had two ships in port for the first time since 2006, with the Seabourn Quest and the Pearl Mist, for just over 1,000 passengers. Both the Quest and the Mist will return later this year in addition to the Crystal Serenity and Phoenix Cruises’ Amadea. While the fall is the high season, the first call of the year was on May 25, also by the Pearl Mist. This was the first time a cruise ship had called at the port this early. Most ships will be arriving over the next 10 weeks, for a total of 10 calls and more than 8,000 passengers and crew this fall. For the second year running, Baie-Comeau Cruises organized a fam tour of the different businesses in the city center. Reception staff and tour guides took the tour and were introduced to the range of products and services available so they in turn can share their knowledge with the passengers, crew, and other tourists, as well as residents. 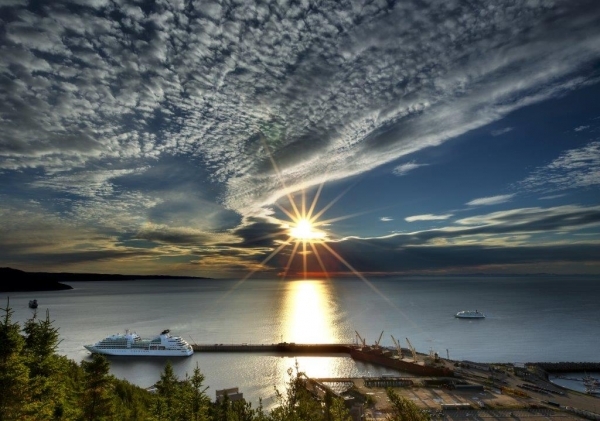 Baie-Comeau Cruises is a non profit organization whose mission is to promote and develop the tourist attractions and businesses in Baie-Comeau and the Manicouagan region and to operate an international cruise port to help raise Baie-Comeau’s profile in international markets.